Innova Market Insights has released its top trends for 2018, with “Mindful Choices” tipped to be the number one trend for next year. THE INCREASINGLY thoughtful and mindful consumer will continue to catalyse changes in the way that companies produce, package and label their products. The other element driving the “mindful choice” trend is about peace of mind while making a positive impact in the world, through ethical claims. In fact, there has been a +44 percent CAGR in ethical claims (2010-2016, global), which includes ethical animal/human/environment, excluding ethical packaging. 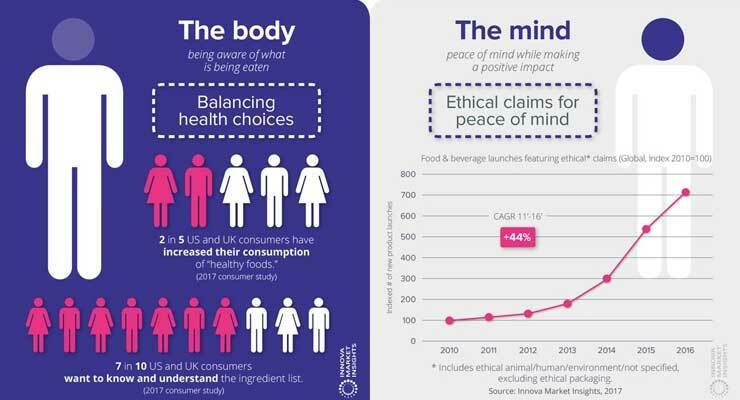 According to Innova Market Insights, 4 in 10 US and UK consumers increased their consumption of “healthy foods,” 7 in 10 want to know and understand the ingredient list, 1 in 5 in the US are most influenced by “real” ingredients, and ethical claims on packaging are top of mind. In response, better-for-you claims continue to be on-trend, having increased their market penetration from 42 percent in 2012 to 49 percent in 2017 YTD. Today’s consumer has fully embraced a more holistic approach to looking after their well-being, which increasingly focuses on peace of mind as well as the body. From health concerns driven by cleaner and overall healthier lifestyles, to environmental issues which responsible manufactured food & beverage tackle, bringing “peace of mind” is key. “Today’s consumer displays a high level of mindfulness about well-being and the environment,” explains Lu Ann Williams, Director of Innovation at Innova Market Insights. “We are still conscious of protein and clean label. We didn’t want to give the impression that they weren’t important. But at the same time, we wanted to progress and talk about what is after that. “Those things are never going away and they are actually really related to things that are happening. Everything is possible when it comes to trends and that’s what our top ten trends reflect this year,” she notes. “Trends reflect how consumers have evolved over the years and now consumers are being sensible when it comes to food choices, products are being simplified and easier to understand for the mindful consumer,” she adds. 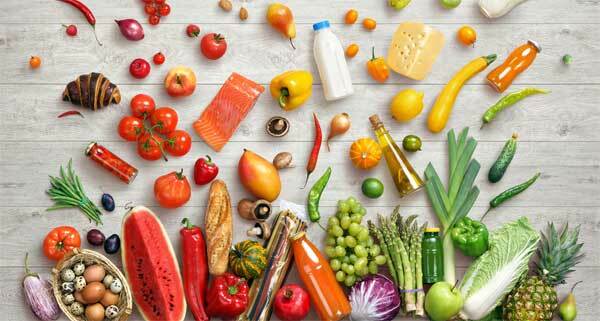 “Mindful Choices” leads the list of Innova Market Insights’ Top Ten Trends for 2018, where the company continuously analyses global developments in food and drinks launch activity and consumer research to highlight the trends most likely to impact the food and drinks industry over the coming year and beyond. “The next top trend, Lighter Enjoyment reflects a lot of things happening in the food industry,” says Williams. “Diets are out, but there are many lighter versions of foods available. A very interesting trend that was identified was trend number five, Beyond the Coffeehouse, Williams also noted: “Everybody is doing specialty teas and coffee. Competition is fierce but what you see now is coffee flavours everywhere, this has jumped out of the category. “There is a hype around coffee and tea. Coffee used to be a thing that your old parents drank, but once it jumps the category its becomes super interesting – it’s a force on its own – one thing we do see is that shelves are heaving with passion, and that’s the driving force behind this trend,” she states. 1. Mindful Choices. Consumers are more conscious than ever about making responsible food choices, and increasingly want to know what is in their food and how it is produced. Innova Market Insights research data indicates that 1 in 2 US, UK and German consumers read ingredient labels often and that 7 out of 10 US and UK consumers want to know and understand ingredient lists. At the same time, rising levels of interest in ethical issues have resulted in the use of ethical claims for food and drink NPD soaring in recent years, with a CAGR of 44 percent over the 2011-2016 period. 2. Lighter Enjoyment. As consumers continue to look for ways to eat and drink more healthily, lightness in terms of alcohol content, sweetness, flavour, texture or even portion size is increasing its appeal, although definitely not at the expense of a familiar, high quality and indulgent taste profile. 3. Positively Processed. As consumers become more concerned about naturalness and minimal processing techniques, the industry is reviving traditional processes such as fermented foods and cold brew tea and coffee, alongside the development of new ones. 4. Going Full Circle. The notion of closing the circle is increasingly taking hold, with greater consumer expectation that companies and brands will be more resource-smart via developments such as tip-to-tail eating, innovative uses for food waste and more biodegradable and renewable packaging. 5. Beyond the Coffeehouse. While coffee is clearly trending among Millennial and Generation Z consumers, tea is also seeking to reinvent itself among the younger generations. With the taste and experiential associations of coffee and the healthy image of tea, the industry is increasingly using coffee and tea as ingredients and flavors outside the hot drinks and iced tea and coffee sub-categories across a wide variety of products as varied as energy bars, yoghurt and jam. As Williams stresses, several trends have established themselves as true driving forces that will only continue. These include free from, clean label and high protein foods. Free from foods accounted for 22 percent of new food & beverage launches (2016, global), with 20 percent CAGR growth in free from food & beverage launches (2012-2016, global). Clean label foods accounted for 26 percent of new food & beverage launches tracked globally in 2016, with 16 percent CAGR in clean label food & beverage launches (2012-2016). You can register for the FoodIngredientsFirst-hosted The Top Ten Trends for 2018 webinar here. FoodIngredientsFirst recently interviewed Innova Market Insights analyst, Andrea Launay, about the rise of active nutrition in NPD. You can view the video here.